Found 2 file extension associations related to Express Scribe and 1 file format developed specifically for use with Express Scribe. Uses 'hot' keys to control playback when using other software (eg. Word). Ability to dock both analog and digital portable recorders to load recordings. 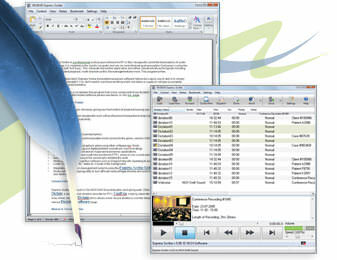 Works with Microsoft Word and all major word-processor applications. Integrates directly with Express Delegate Dictation Workflow. Automatically sends typing to those who dictated the work. Loads CD audio directly - start to work as it loads in the background. Can switch to 'mini' mode to reduce screen space. Integrate with dictation management systems using the Express Scribe SDK. Works with FastFox typing utility to turn difficult medical/legal phrases and common terms into mere shortcuts from your keyboard. If you need more information please contact the developers of Express Scribe (NCH Software Pty Ltd), or check out their product website.